How Much Weight Should You Lift To Build Muscle (And When To Lift More) « Burn The Fat Blog – Tom Venuto. Understanding how to choose the right weight is so vital, you could be completely wasting your gym time if you don’t get this right. That’s why I’ve created a set of guidelines that will help you choose the right weight and show you how to increase the weight and reps over time with the best results. Please note; this is not a discussion about how to get stronger per se, only how to know if you’re using the right weight to build muscle, and when to increase it. This is also not an exhaustive discussion of all the methods you have available for progressive overload in your workouts (as you will find here in my overload training manual). 1. Work in a repetition max range rather than have a single rep target. Compared to using one rep target like “3 sets of 10 reps” or 5 sets of 5 reps,” using a rep range makes it easier for most people to choose the right weight and know when to increase it. The most vital first step is to choose the rep range most compatible with your goals. For example, if your primary goal is strength, training exclusively with weights so light that you can do 20 reps on every set is clearly the wrong way (that’s training for muscle endurance). If your primary goal is bodybuilding, training only in the 1 to 5 rep range is not the right way either (that’s powerlifting). Typically the range most often recommended for muscle growth (hypertrophy) is 6 to 12 reps (or 8 to 12 reps, depending on who you ask). Beginners usually start by choosing one rep range, and they shouldn’t worry about rotating rep ranges at first, because beginners respond well to almost anything. As you advance, using periodization (varying the workout stimulus day to day or week to week including the rep range), becomes increasingly beneficial. Ultimately, for building muscle, using multiple rep ranges is ideal for advanced trainees, and this is often done by using the “heavy day – lighter day” system or a heavy-medium-light system. At this stage, the majority of your training would still fall in the 8 to 12 range, but with some heavier work below 6 reps and some lighter work above 12 to 15 reps. Note for women: Most trainers do not like the word “tone,” because technically, there’s no such thing. However, I think it’s fine if women who are not bodybuilders or physique athletes swap out the words muscle “hypertrophy” or “growth” (size) with “toning” or “firming” and here’s why: If women believe they are going to get bigger doing sets of 6, 8, 10 or 12 reps, many may instead keep choosing tiny light weights that they could rep out all day long – but that actually gets you nowhere because it’s not enough resistance. Women lack the testosterone to gain muscle “mass” the way men do, but when women train in the optimal hypertrophy rep range, the effect is exactly what they say they want: “muscle shaping, firming and toning” (think “better curves”). You only achieve that by training with enough weight in the right rep ranges. 2. Increase the weight if you can hit your the upper number in your rep range (or more) on all of your sets. Once you know the rep range you’re aiming for, adjusting the weight is simple: When you hit the higher end of your rep range on all your sets – in good form – that is your signal to increase the weight at your next workout. If you hit the upper number in your rep range target and it was super-easy, (you feel like you could have kept going for several more), you don’t even have to wait for the next workout, you could increase the weight right then and there for your second set. Here’s an example: If your target was 3 sets of 8 to 12 reps and you hit all three sets of 12 (the upper number in your rep range target), with good form it’s time to increase the weight for the next workout. If you only hit one set at the upper end of the target range, for example, if your three sets are 12, 11, 10 reps, yes, you can still increase the weight if you want to, because you did hit one set of 12, or you can stay at the same weight and keep working toward that goal of 3 full sets of 12. You can make your own judgement call on that. 3. Decrease the weight if you can’t hit your lower rep max number on any of your sets. The flipside of the above also applies: An absolutely certain way to know if the weight is too heavy is when you can’t hit the low end of your rep range on any sets. If the rep range you’ve chosen is 10-15 reps and you can’t even do one set of 8 or 9 reps, it’s absolutely too heavy and you should reduce the poundage. 4. Remember that sometimes it’s normal for reps to drop with successive sets. If the reps drop slightly, that’s ok, in fact, because usually it means you’re working hard on the early sets. On the other hand, losing steam with each passing set and exercise as the workout goes on can also be a sign that you’re tired, sleep-deprived, under-fueled, under-nourished, under-recovered from previous workouts or not mentally focused. The end result of all the above is that you may not always hit your intended number of reps or even your intended rep range. If you’re doing 3 sets of 8 – 12, it might look like this: set 1: 12 reps, set 2: 10 reps, set 3: 9 reps. This is normal and okay. Just keep working to get stronger and do more reps on each set in future workouts when you feel able to do so. On the other hand, if your goal was 8 to 12 reps and you did 11 reps, 8 reps and 6 reps in each set, that’s too much dropoff and you should consider using the strategies above so you stay in your target rep range). 5. Understand that it’s normal for one arm to be stronger than another at first. Since most of us have a dominant side, it’s perfectly normal for one arm to be a little stronger than another. It’s also quite possible that one arm may randomly get one more rep than the other. Don’t worry about it – it’s just one rep. In fact, you might want to give yourself a plus or minus (+ / -) one rep rule on every set of every exercise you do because it helps you relieve the stress of worrying about the small stuff like this. For example, if one day you do 12 reps with your left arm and 13 reps with your right arm, that’s fine. In this case, it is like horseshoes or hand grenades – close enough is close enough. NOTE: training with dumbbells and unilateral exercises over time can help even out your strength. 6. Increase the weights in relative increments and expect the weight increases to slow down as you get more advanced. Common recommendations for progressive resistance are to increase the weight by 5 to 10 pounds or 5% to 10% at a time. Keep in mind, however, that this is not the same amount. Percentage is relative, while pounds are absolute. The actual amount you can increase can vary for many reasons, including the type of exercise and how many years you’ve been training. A strong guy might curl 50 pound dumbbells for reps with strict form. A 5 percent increase would only be 2.5 pounds – increasing to a 52.5 pound dumbbell, a small and manageable absolute increase.Even adding 10% and moving up to the 55 pound dumbbells is do-able. Compound barbell exercises like squats and deadlifts or machines like leg presses allow you to use much heavier weights, so the absolute amount of weight increase may be higher. If a 200 pound man is squatting 400 pounds, increasing by 5% (20 pounds – a 10 pound plate on each side) is possible, but a big jump in absolute terms. A 10% increase of 40 pounds is probably out of the question. Adding just 5 pounds on each side of the bar, jumping up to 410 lbs, a 2.5% increase is good progress. That brings us to another point: How small of a weight increase you use is often dictated not only by the type of exercise and your training age, but also by the equipment you have available. Special equipment can make slow progression through small weight jumps possible. This is known as micro-progression. Most dumbbell racks only go up in 5 pound increments. But some well equipped gyms have a rack of dumbbells that goes up in 2.5 increments and these are fantastic for slow progression. A second option is the adjustable dumbbells where you put free weight plates on the side of each dumbbell handle and secure them with collars. Weight plates are available in 2.5 and even 1.25 pound increments at fitness and sporting good stores. Also, some collars have weight and whatever the collars weigh also counts. A third option is magnetic plates (such as PlateMates). 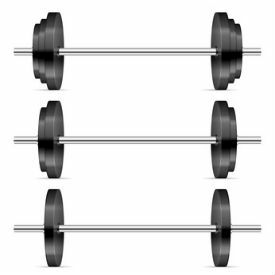 If you are using metal dumbbells (not encased in rubber – and hopefully not those old vinyl Kmart plates), the micro-weights attach magnetically. These come in 1.25 pound increments so one on each side of a bell makes your 2.5 pound increment. Microprogression is valuable all the time for small body part isolation exercises, but it also comes in handy for advanced lifters. After years of experience and progression, you have already captured all your rapid “newbie” gains and your rate of progress, both in muscle growth and in strength, slows down dramatically. Personal records (PR’s) come much more infrequently. Nevertheless, it remains the goal of most lifters to continue finding ways to get stronger and hit new PRs. Of course, there is the powerlifter joke that “real men” are only allowed to add 45 pound plates on the bar, (Olympic bars loaded with 45’s go up: 135, 225, 315, 405, 495), but I’d take that one with a grain of salt if I were you. No matter where you are on the strength spectrum, never turn your nose up at small increases and keep in mind that you will not always be able to increase the weight. 7. Use the double progressive system, working up in reps, then weight, then repeating. One reason you can’t increase the weight predictably every time is becasue almost everyone has natural up and down days. Some days you are stronger and more energetic than others. Another reason is that beginners make much faster progress than advanced trainees. The longer you’ve been training, the slower your progress typical comes. Whatever the reason you can’t increase the weight at the moment, you can almost always do one more rep with the same weight, and one more rep is not an intimidating goal. This is the “one step at a time” mentality, and while it may seem like it will take forever moving up one rep at a time, remember that you are going to be training for a lifetime and it’s vital to appreciate slow progression. 235 pounds X 12 reps – Achieved rep goal — increase weight. 245 pounds X 8 reps – Drop back to low end of rep range. This is a simplified, linear example. More often, progress comes in spurts, and then plateaus. You might jump three steps forward and then one step sideways (or back). Sometimes you’ll make fast strength gains and increase the weight every workout. At other times, you must be patient and move up one rep at a time. That’s the main point of the double progressive system: If you add even one more rep with the same weight each workout, that’s progress! In this example, it took 10 workouts to move up by 20 pounds. Patience, combined with good record-keeping with a training journal pays off. 8. Use other methods of progressive overload instead of using progressive resistance. Adding more weight to the bar is the big daddy of progression methods, but it’s not the only way to challenge yourself to improve your performance. As mentioned above, doing more reps with the same weight is a form of progressive overload. Adding volume is a method of progression as well. That means more sets and more exercises. Contrary to what the minimalist training gurus claim, increasing volume can often work shockingly well, as long as you do it within your recovery ability, within practical restraints such as time available, and you appropriately cycle between lower and higher volume workouts. Density training is yet another method of overload. That means doing the same volume of work in less time, doing more work in the same time or even doing more work in less time. The use of increased intensity of effort techniques or set extension techniques can also overload your muscles. Drop sets, supersets, giant sets, static holds and so on – using the same weight – all give your muscles a new challenge. You could even argue that stricter form with the same weight is also an overload of sorts. 9. Take a deload or back off period, then start your progression over again. Sometimes when you hit a sticking point and the weights or reps don’t seem to move, it doesn’t mean you’ve done something wrong, it means you have built up to a temporary peak in intensity, volume and so on. There is another potential peak with advancement and personal records ahead of you, but first your body needs a short rest before climbing that next mountain. After your training has reached an intensity peak, your body is “stressed out” and needs a break to avoid being pushed into an overtrained state. But instead of taking a total rest week, you continue to train, and simply back off the weights and intensity for a short period. This is known as de-loading, and it allows your body a short time to recover and “reap” the gains you obtained in the previous weeks. This is a phenomenon known as “super compensation,” which means that even during that de-load week, you continue to see gains, often good ones, which is a result not of the deload week by itself, but the intensity peak that preceded it. What often happens after a de-load is you can pick up where you left off (or take one step back to prep for 2 or 3 more steps forward), and when you do resume training full-bore, you break through to a new PR by the end of the next cycle. Sometimes you reach a point where you have milked all the results out of a particular exercise routine and it’s simply time to change it. This sometimes involves changing the frequency, changing the volume, changing the set and rep parameters or changing the techniques used. Most often it involves changing some or even all the exercises. It may not be necessary or even beneficial to change all the exercises, but changing some exercises on a regular basis is important to continue producing new progress (it also helps you avoid boredom and burnout). Because some exercises are so fundamental and effective, you might stay with those exercises, but change the other variables mentioned above. Alternately, you keep the basic movement pattern and use an exercise variation. Examples include changing from back squat to front squat, from conventional deadlift to hex bar deadlift, from barbell press to dumbbell press or from barbell row to dumbbell row. Sometimes as little as a grip change is enough, such as moving from pull up to chin up, from supinated row to pronated row, from wide grip pulldown to close grip pulldown and so on. For years, I’ve been bombarded with questions about how to choose the right weight and when to increase it, and I hope this tutorial on progressive resistance has helped clear up up this often-confusing subject. 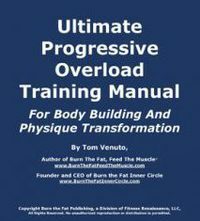 If you want to learn more about all the other progressive overload systems (not just progressive resistance), then be sure to download a copy of my new e-book, The Ultimate Progressive Overload Training Manual For Body Building and Body Transformation.